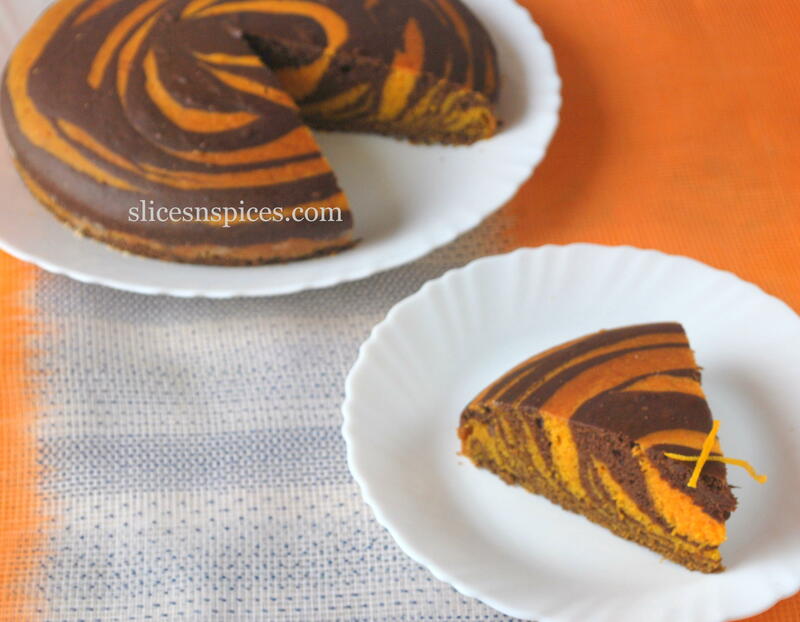 zebra cake – my 25th post!! A special cake for a small special ocassion. My first milestone, and am I thrilled!! a shaky start, infinite lessons learnt, just a beginning, fabulous experiences in the process but above all, tons of hardwork! I never imagined while staring at the glossy websites and drool worthy pictures, what effort goes behind creating it. From recipe searching to cooking to photography to putting into words, which is just one part of the task. The technical aspects of building a blog is something I keep learning every day, thanks to my colleague and technical support Dr.Debashish. If not for him, my blog woudn’t have been breathing today.All said, I’am still miles away from that ‘picture perfect dish’. My blogging experience of around two and half months is something I will cherish forever. Packing a tiffin was a very reluctant task for me before, something I would assemble in a hurry. But now it’s well planned a week ahead. Giving attention to the minutest details of food has made me appreciate the most trivial things of life too. 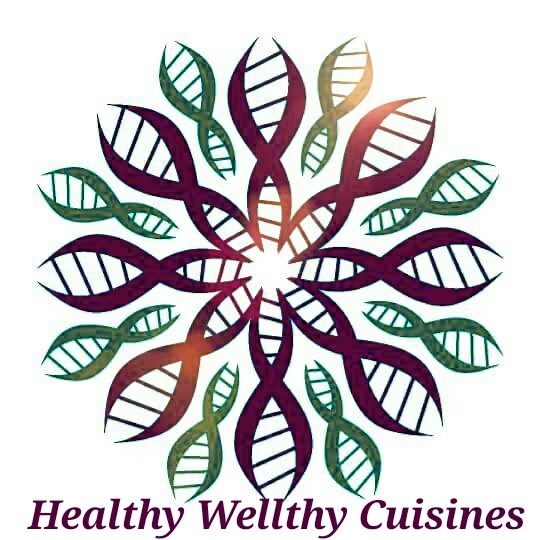 Balancing taste, health and presentation is a challenge which I prepare for every day. I never valued the statement ‘you are what you eat’ as much as I have today. I now understand how mother used to associate my every small illness with my erratic eating habits and how much now I appreciate reversing and inculcating them in my kids.Food is a celebration, the greatest joy you can give to your loved ones…. Today’s cake is special also because of its technique. As the name suggests, Zebra represents alternate dark and light coloured stripes. 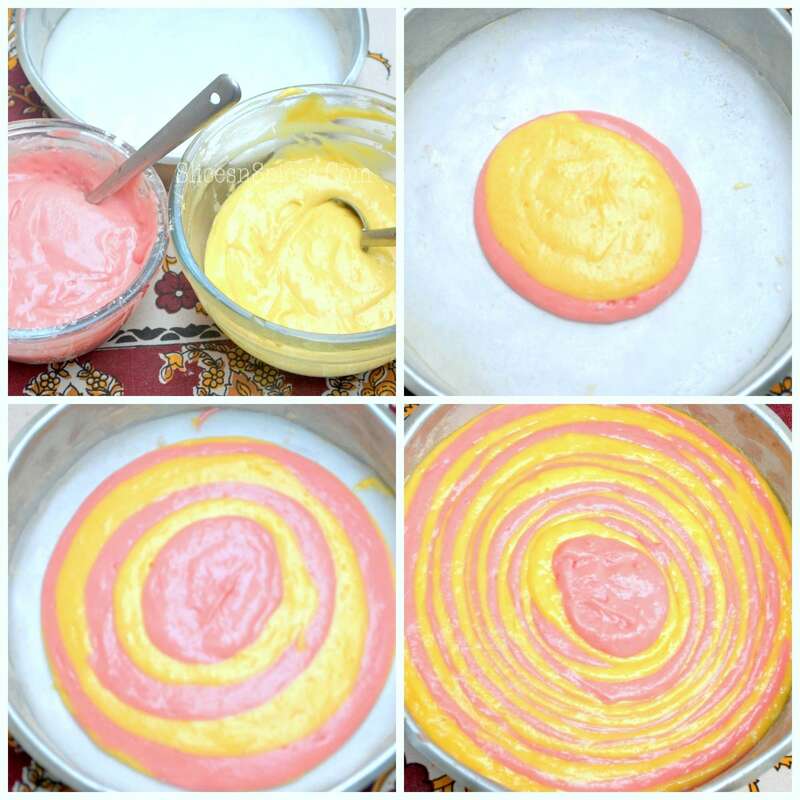 At first I attempted this cake with two very pale colours, yellow and pink. 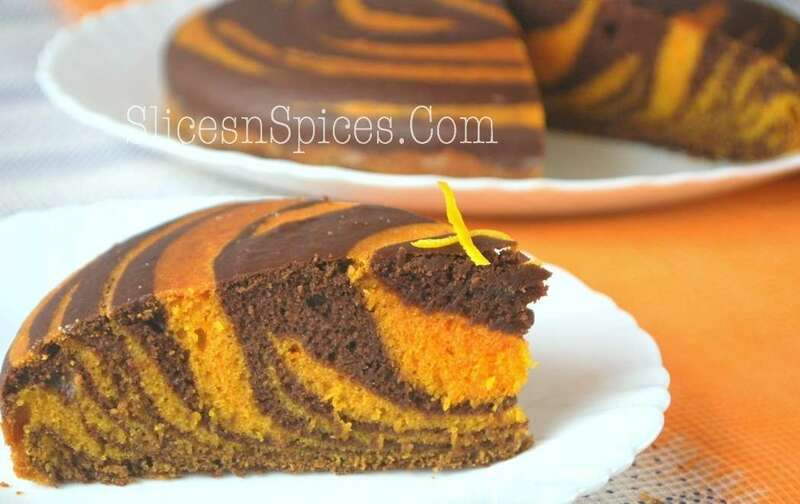 Although the technique was spot on, the stripes did not show in the final bake, as everything had browned. Next,I repeated it with two fail proof colours and flavours- chocolate and orange. Although the technique became a bit offcentered, the final outcome had a beautiful contrast of colours. So I will be posting my pale coloured pictures for the technique and the brighter ones for final cake. grease,line and flour a 9 inch round aluminium cake tin. Use a baking paper to line the tin. After so much of hard work you don’t want a spoiled pattern by a half stuck cake in the tin. sift dry ingredients for both the flavours in seperate bowls. prepare their liquid mixture in seperate bowls by using an electric or hand whisk to beat curd and sugar well. add oil, essence and mix till the mixture is uniform. add orange food colour to one of the bowls containing liquid mixture. 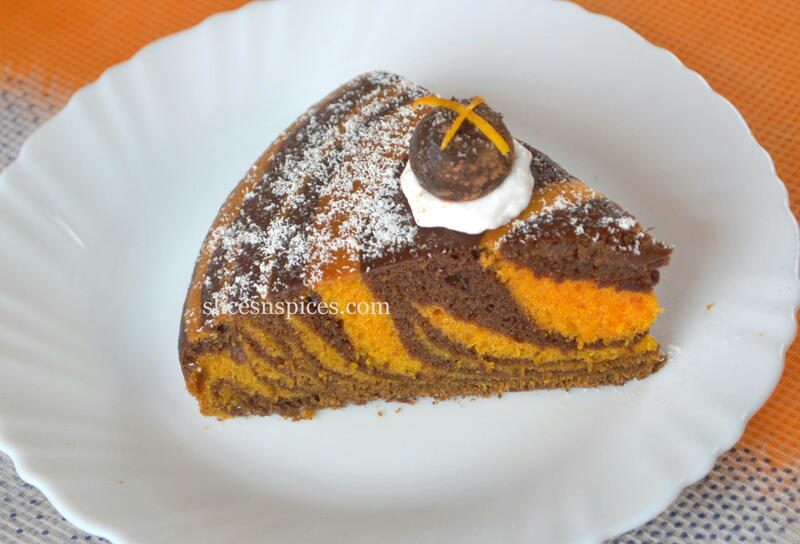 combine the cocoa powder containing flour mixture into the non-coloured liquid mixture and plain flour mixture into the orange coloured liquid mixture. with the orange and chocolate batters ready , take two equal sized spoons/ladles to pour it into the pan. 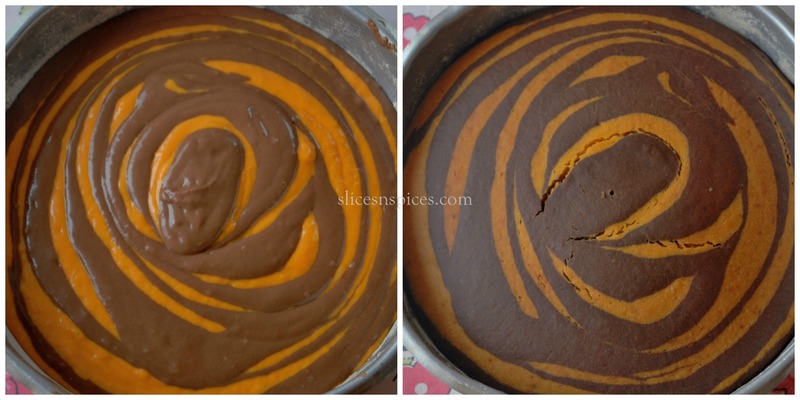 arbitarily mark the centre of the tin and pour the first mixture either chocolate or orange in the centre of the tin. gently tap the tin on the counter. now add the other flavoured batter on top and in the centre of first one. again gently tap to allow it to spread. do not shake vigorously or try to spread the batter with the ladle or spoon. the batter will gradually spread out on adding further layers. repeat the same process by alternating the colours, gently tapping after each flavour. once both the batters are finished, give a final tap to the tin to remove any entrapped air bubbles. bake it in the oven for 35-40 minutes until the toothpick inserted at the centre comes out clean. slice it to reveal the beautiful riot of colours inside your masterpiece creation!! ‘Its a zebra cake with tiger stripes’, said my son! Such a tasty looking Cake! I Congratulate you for such a mouth watering post.